It seems that My Hero Academia: Vigilantes has become a bit of a sleeper hit recently! Though it may be under the radar for some fans of the main series, those that are following this spin-off have been pleasantly surprised with strong, consistent character work, sprinkles of offbeat humor and solid action. In my review for the previous volume, I praised the addition of some great new side characters to the series, as well as a slightly more tongue-in-cheek approach to its chapters, a welcome respite following the much darker tone present in volume 2. While I had a blast with these quirky (pun intended) capers, the main overarching plot involving the Vigilantes chasing down the Quirk-boosting drug known as Trigger did take a back seat for the most part. However, right from the opening chapter of this volume (heck, even from the cover itself) Furuhashi and Court make it clear that Trigger and our main villain, Kuin Hachisuka, are back to take the center stage once again, and this might be the toughest battle for our vigilantes yet. Oh yeah, did I mention they also have to juggle with a big launch event performance, complete with catty co-stars and unforeseen technical difficulties? And you thought the Pro Heroes had it rough! So just how will the Vigilantes trio survive all this? Read on to find out! The opening chapters of this volume lay the groundwork for the two major events that this volume is comprised of, those being the hunt for Hachisuka by Knuckleduster and Pop Step's first professional gig at the launch event for a local department store reopening. We will constantly bounce between these two events throughout the volume, so we are never left waiting for resolution for too long. For Knuckleduster's time in the spotlight, we see him utilizing former thug and current Intel gatherer Soga Kuguizaki and his buddies (another great example of Furuhashi's nifty knack for finding ways for minor characters to stick around) to source info on Hachisuka, as well as pushing himself to the limit in his training. Knuckleduster's never been one to take it easy, but it's clear even from his more direct nature with Koichi and Kazuo that he's going beyond as he closes the net around his Trigger target. With a rare glimpse at Knuckleduster's personal life in the form a visit to his wife in hospital, we can see that Knuckleduster may have a personal stake in this next battle, adding further credence to his increased drive to track down Hachisuka. These scenes are interlaced with the build-up for Pop Step's focus for this volume, as she receives an invitation to perform at a live event dubbed "the Narahuta Festival", along with a motley crew of local singers, a dance troupe and a band, and even a guest appearance from a Pro Hero or two! Understandably this jump from amateur to pro is more than a little nerve-wracking for poor Kazuo, but thankfully Koichi (and more importantly, Makoto) is there to give her the helping hand she needs to prepare for her first big event and make the inaugural Narufest a show to remember! Just like with Soga and his cronies, it's cool to see a great character like Makoto return so soon in the story, and with her connections to Captain Celebrity and impeccable management skills, it's only logical for her to return. With Kazuo, Koichi and Makoto all busy with event preparations, it's clear Knuckleduster will have to takedown Hachisuka solo. These initial chapters do an excellent job of setting the scene for some major events, and thankfully we don't have to wait long for the pay-off to arrive! If it hasn't become clear at this stage, this volume has very little focus on our primary protagonist, The Crawler himself. While on the surface it might seem odd to for the series to shift focus from the main character as early as volume 4, I have always considered the Vigilantes trio to be an ensemble of leading characters, so it's only fair that Knuckleduster and Pop☆Step get their moment in the spotlight, especially when volume 3 had such a strong focus on Koichi, and he's still there to support Kazuo as best he can with his usual bumbling goofiness. She'll need all the help she can get too, as she's very much thrown into the deep end during prep for the festival, surrounded by professionals in their chosen performing craft, and it's more than a little intimidating when one of the meaner singers starts throwing shade her way for her looks. With the introduction of these other performers, we also get a return of some of the wacky humor I enjoyed so much in the previous volume, including a hilarious case of love at first sight from the respective band and dance squad leaders. With the news from Makoto that the ragtag bunch will, in fact, be headlining the event we see some Plus Ultra drive from the performers, especially Kazuo, as they put in the blood, sweat, and tears into their practice to ensure a memorable performance. When the catty singer injures herself during practice and is worried she'll lose the spotlight to Pop, Kazuo picks up the slack for her to make sure they can all shine at what they do best on the stage, proving that you don't need in costume to be a hero (or a vigilante! ), you just need to do the right thing. As the day of the festival fast approaches, Hachisuka makes her move in the shadows with a familiar Trigger victim, and she has selected the new target of Narufest, it looks like this performance is definitely going to be one to remember indeed! Finally, the day of Narufest arrives, and all that set-up pays off. We see the rag-tag bunch of performers has combined together to form a cohesive unit, calling themselves the Feather Hats (complete with classy matching outfits!). Some fan-favorite Pro Heroes also make an appearance to spice up the event. One notable absence is the Erasure Hero, Aizawa, who on top of having a general aversion to public events, is too busy tangling with Hachisuka's latest Trigger experiment, with Hachisuka herself lurking in the shadows to monitor its performance. It's here that the "main event" of the volume begins if the cover is to be believed anyway. Knuckleduster arrives on the scene, with a declaration that he's going to bring "Tamao" home. throughout the volume it's been subtlety hinted that Knuckleduster has a personal connection to Hachisuka, and it's during this stand-off that we find out that Hachisuka is, in fact, Knuckleduster's daughter, Tamao Oguro. Or, more accurately, Oguro is currently the host the parasitic bee user villain known as Hachisuka. In a series of tragic flashbacks, we see growing friction between Oguro and her father, resulting in Oguro walking out on her family and being singled out by Hachisuka to be her new host. As a result of these flashbacks, the stakes for the battle increase exponentially, as Knuckleduster not only has to eliminate the threat of Hachisuka, but rescue her daughter's body from the parasite's clutches in the process. Meanwhile, the other Vigilantes have problems of their own. Hachisuka's Trigger victim's outburst has resulted in a power outage for the whole block, Threatening to force Makoto to call off the concert. Thankfully Pop☆Step, with her experience aiding civilians during villain attacks, is able to take control of the situation and keep the audience calm while the heroes handle the threat, ensuring the show can go on once power is restored. Just as Kazuo gets her chance to shine with her specialty, so too does Knuckleduster. We see his cunning intellect in full effect as he enacts a crafty and creative plot to free his daughter from the parasite's grip, as well as an uncanny pain threshold to withstand Hachisukas's Trigger-boosted attacks. Both Knuckleduster and Pop☆Step manage to save the day respectively, allowing the Narufest event to conclude, and while we are left with a cliffhanger on the fate of Tamao, it's clear Hachisuka has been well and truly defeated. Though, as the last few pages of the chapter reveal, even though Hachisuka is off the table, the threat of Trigger still looms large. It's a thrilling climax with plenty of pay-offs, while setting the stage for an even greater foe in the process! The final chapter of the volume is a neat bonus in the form of "Episode Zero", a special introductory chapter that served as a sort of sneak peek trailer for the series before it began publication. While Furuhashi himself admits the chapter isn't canon as it features the Vigilantes characters from five years in the past interacting with the cast of My Hero Academia today, it is because of it's out-of-continuity nature that it succeeds so well as an introduction to this new series. By utilizing the readers familiarity with Deku and the gang to showcase the new Vigilantes concepts and characters, Furuhashi is able to capture even the most casual fans attention and get them interested in the new series. 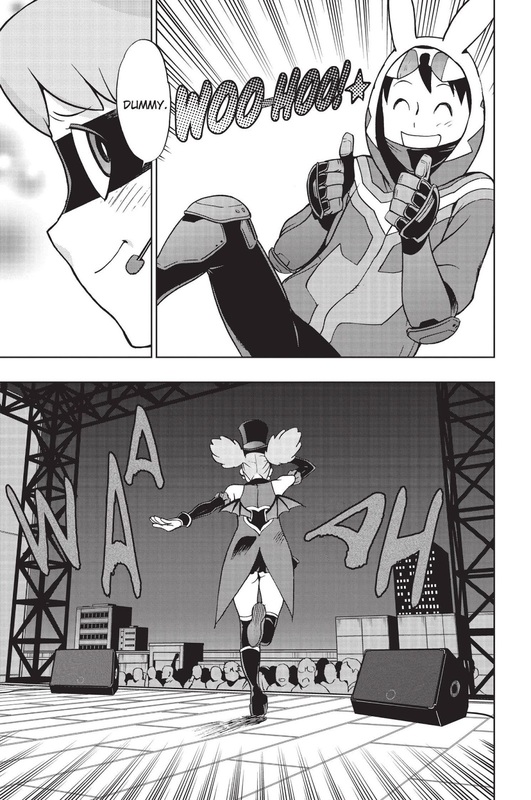 It's nice to have a bonus chapter like this included as an extra, but Considering the world seems to be in the thralls of My Hero Academia fever these days I think it would be a great idea for Publisher Viz to release this chapter separately as a little freebie to promote the series and give it the attention it deserves. if My Hero Academia gets lucky enough to get featured again for Free Comic Book Day 2020, I think this chapter would be a great choice. A fun end to a thrilling volume! Vigilantes continue to impress with every volume! In many ways volume 4 is the culmination of a lot of set-up from previous volumes, including Pop☆Step's development from amateur idol to Narufest superstar, and of course, the takedown of the first major Villain of the series by Knuckleduster (your mileage may vary on Stendhal from volume 2, but I always considered him to be a Vigilante more than a Villain) by Knuckleduster. While it was initially surprising to see Koichi take the back seat this time around, it was great to see the other Vigilantes get their moment in the spotlight, and deliver thrilling conclusions to their own arcs themselves. Solid set up, strong pacing and consistent character work result in a very rewarding volume. I was engaged reading both sides of the Narufest event, so I was never really disappointed when the focus jumped from Knuckleduster to Pop, or vice versa, and both wrapped up their arcs in a very satisfying manner while leaving room further development in the next volume. 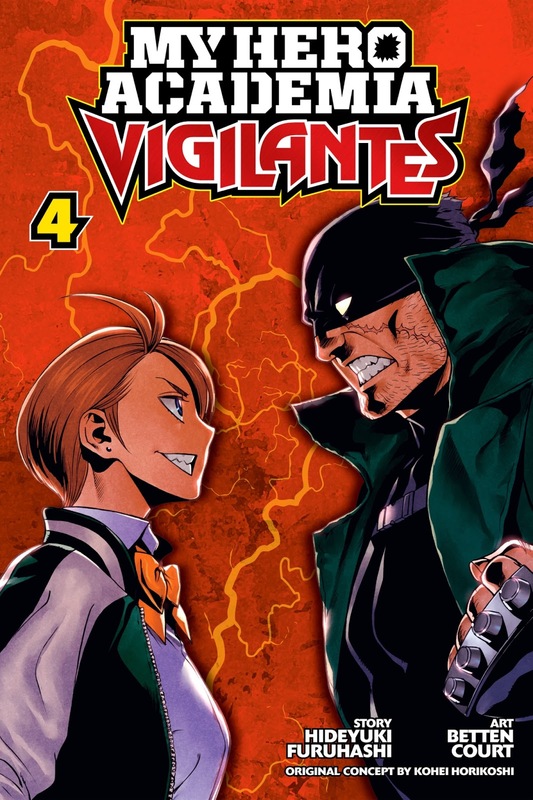 I've said it before and I'll say it again, fans of My Hero Academia who haven't checked out Vigilantes or dismiss it as a spin-off not worth their time are missing out on a highly entertaining read. I'm hoping this level of quality can be maintained in the volumes to come!